Google’s new AdWords experience was made available to everyone in October 2017. If you’re like most advertisers, you’ve probably tried to navigate its newer features. Maybe you’re starting to get more comfortable with it. Or maybe you’re completely lost, and want to stay in the confines of the previous AdWords experience for as long as possible. Regardless, AdWords is working to transition all advertisers to the new interface in the near future. You need to start getting ready to make the move. The new AdWords experience is, for the most part, much more aesthetically pleasing than the previous interface. It has a more modern look-and-feel. There are a number of features that are not available yet — like Bulk Uploads and Google Analytics columns (full list of not-yet-available features here). Saved Column layouts also do not transfer, which is unfortunate, but overall, the new design seems like it will make managing Campaigns easier and faster. Faster experience. Click into different sections of the interface and you’ll immediately notice how much more responsive the new experience is. There appears to be little to no lag. The new search function (press G and then T or click “Go To”) improves the ease of navigation. Clear navigation. The new experience offers a more organized layout. Areas of the old experience that were previously available in separate tabs have been consolidated into one tab. The Page Menu will only show items that are relevant to your view (e.g. Ad Group-level versus a higher level). Improved reporting. The Overview section provides a high-level report of performance that you can view at the Account, Campaign, or Ad Group level. 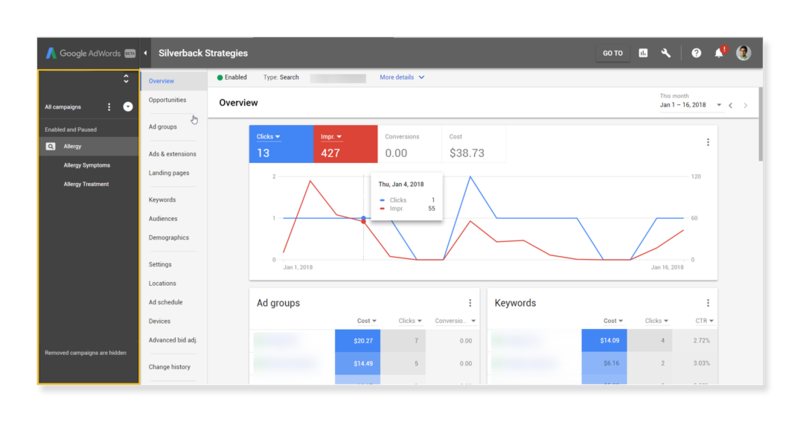 Below are some of the key areas in the new AdWords experience, as well as some big changes from the previous experience. Google is still testing and making changes to the new AdWords experience, so we’ll be updating this guide as major changes occur. Let’s start with the header in the new AdWords interface. At the top left of the interface, you’ll find an arrow that you can click to hide or reveal a dark grey Navigation Panel on the left-hand side of the screen. To the right of that arrow, in the header, you’ll see the current Campaign and Ad Group that is selected. If you’re looking at your data at the Ad Group-level, you can easily click on either the Campaign name or Account name to the left of the Ad Group name to navigate to a higher level. In the header, you’ll also see the Go To button, which essentially allows you to hop to any available part of the new interface by searching for it (you can also press G and then T to activate the search feature). 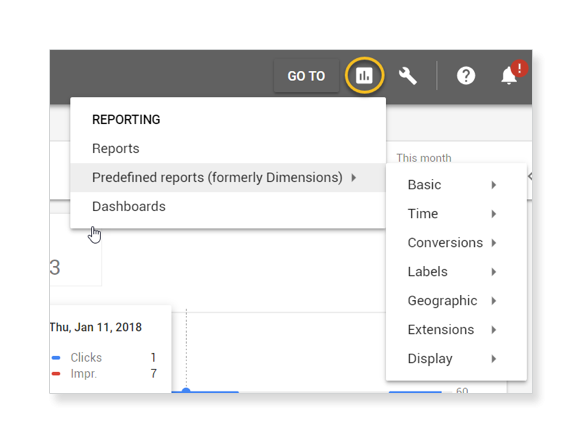 The header also contains the Reports button (Figure 2) that contains a link to custom Reports you can build, Predefined Reports (known as Dimensions in the previous version of AdWords), and a new Dashboards feature that allows you to build and download Dashboard reports that follow the new AdWords modern look-and-feel. The Settings button contains a number of useful tools, all of which were available in the previous AdWords experience (Figure 3). 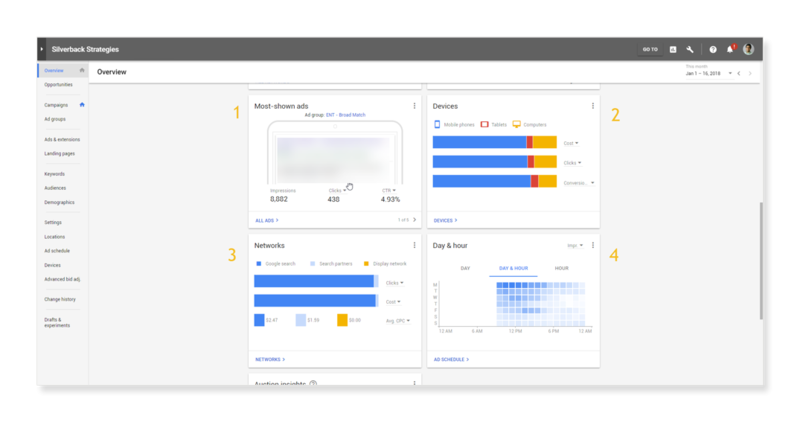 You can see how Google simplified access to more advanced settings in the new AdWords experience. In the previous interface, the Settings icon only revealed setup options (like billing, account access, etc). 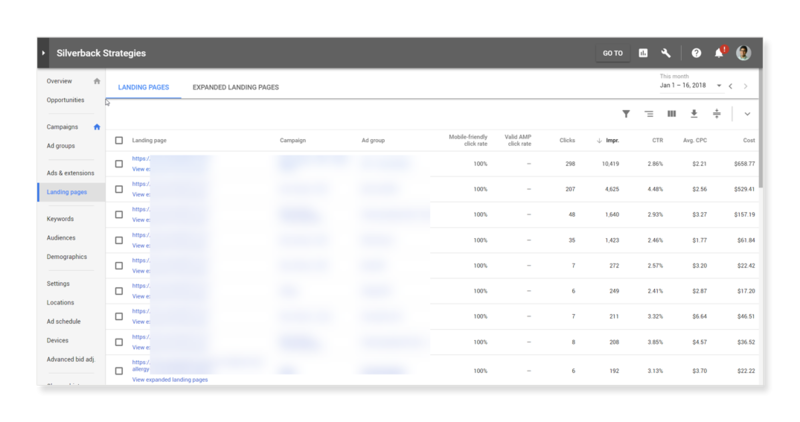 The Settings button in the new AdWords experience also houses areas that were available in the Tools section (like Conversions and the Keyword Planner), as well as items that were accessible in the bottom left corner of the previous experience, like the Shared Library and Bulk Actions. To navigate the new interface, you’ll start with the Navigation Panel (Figure 4) on the left side of the screen. As mentioned previously, the Navigation Panel can be revealed and hidden using the arrow at the top left of your screen, to the left of the account name in the header. The Navigation Panel allows you to view data at the Account-level (All Campaigns), at the Campaign-Type level (Search or Display), at the Campaign-level, or at the Ad Group-level. Clicking into a Campaign will reveal its Ad Groups within, as shown within the Allergy Campaign. The options listed immediately to the right of the Navigation Panel (Overview, Opportunities, Ad Group, etc.) comprise the Page Menu (Figure 5). The Page Menu makes up most of the options that were available in the previous AdWords experience, with some new options added. In the Page Menu, Google decided to include important information that was either a little harder to find in the previous experience or not available at all, such as Advanced Bid Adjustments, Ad Schedule, Demographics, Landing Pages, Opportunities, and Devices. Previously, AdWords provided all Opportunities to optimize an account on one page. 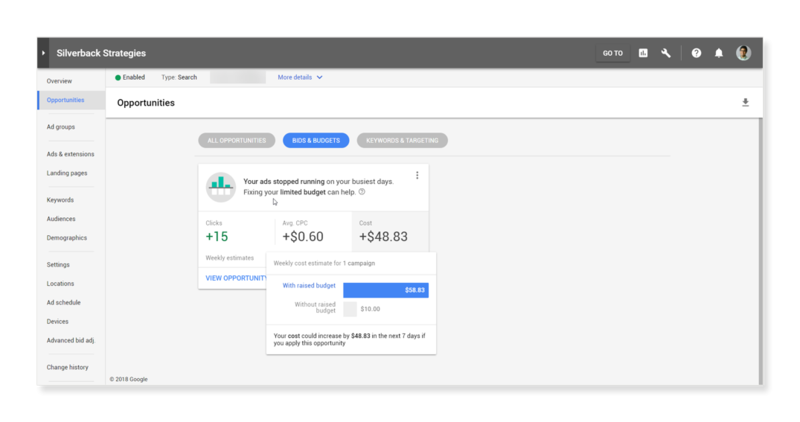 In the new AdWords experience, Opportunities generated by AdWords are now available at the Account-level, the Campaign-level, and at the Ad Group-level. AdWords will check for any available opportunities to improve your account’s health once you click into the tab. With this change, advertisers can look at opportunities specific to a Campaign / Ad Group, as opposed to being served opportunities for multiple area of your account in one. As mobile traffic continues to increase over time, it’s important now more than ever for advertisers to know how mobile friendly their website is, and what they can do to improve. The Landing Pages view is a new area that will show you performance by landing page, as well as the “Mobile-friendly click rate” of a landing page, which was not available in the previous version of AdWords. The Mobile-friendly click rate metric is a measure of mobile clicks on the Search Network that went to a mobile-friendly page. This provides an easy way to see which landing pages are the most mobile-friendly, and which landing pages could use some work. The data on this tab can be up to 14 days old, so any updates made to a page to increase its mobile-friendliness may not result in a change in mobile-friendly click rate for up to 14 days after. 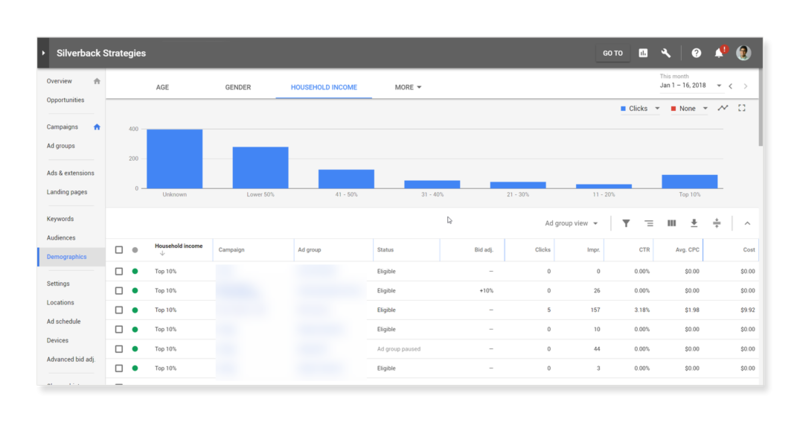 Demographics in the new AdWords experience is much more powerful and accessible than in the previous experience. Clicking into the Demographics section in the Page Menu will display Age, Gender, Parental Status, and Household Income performance. Parental Status was previously only available for Display Campaigns. Household income was available as a location target based on relative household income, but was not available as a demographic. Being able to target both parental status and household income are powerful additions to the new AdWords experience. The new Overview section is a big step forward in reporting for advertisers, and Google has obviously put a lot of effort into trying to make this section both simple and informational. When looking at the overview section, the first thing you’ll notice is the large, aesthetically pleasing chart at the top of the section (Figure 9). This chart will display trends of the metrics you choose at the top of the section (up to four metrics) which you can toggle between by clicking on a given metric card. You can also change the four metrics shown at the top of the section by clicking on a dropdown shown next to one of the metrics. Below the large graph in the Overview section, you’ll find a much cleaner and simpler version of the previous AdWords Home section (Figure 10). It presents data in a much more interpretable way, compared to the previous version which only laid out data in a table format. The new overview section is great because it presents some granular data specific to view (Account-level, Campaign-level, Ad Group-level) while not overwhelming you with information. It provides you with snippets of information for the selected view, and you’re free to click into the data presented in a snippet to see more. Figure 10 displays only a few of the available data snippets in the new AdWords experience. You can see the most shown ad to understand how customers view your brand in the search results (1). You can also see a couple of bar charts that allow you to view a breakdown of the data by device (2) and Network type (3). Last but not least, you can see a heatmap of a metric by time of day (4). Every data snippet allows you to toggle the metric(s) available for the snippet. 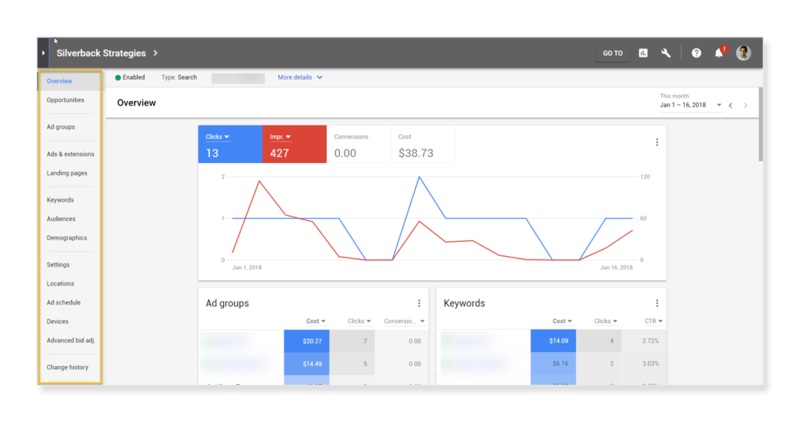 Advertisers should familiarize themselves with all of these key features of the new AdWords experience. Google is also providing many resources to help advertisers transition to the new experience, such as this general overview of the interface (includes exclusive features, difference from the previous experience, and much more) and this YouTube series. Keep in mind that Google, as always, is constantly receiving feedback and making updates to improve the new experience, so you may notice some difference between the interface in the YouTube series and the current interface. 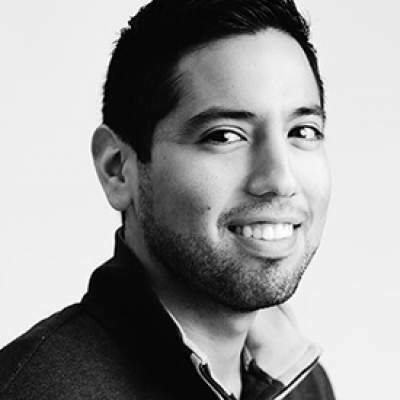 Good luck getting to know the new AdWords, and have fun!